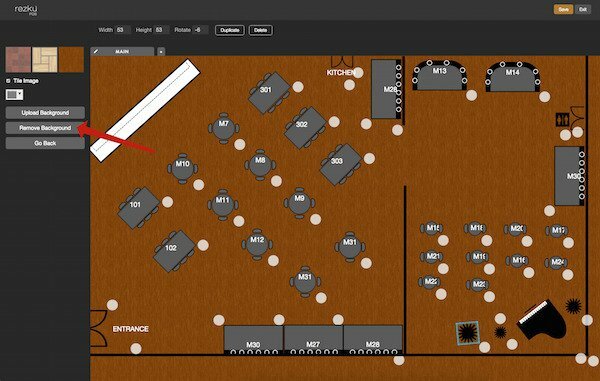 In Rezku POS, you can create a floor plan that matches your restaurant’s layout. This allows servers to easily manage tables they are assigned. 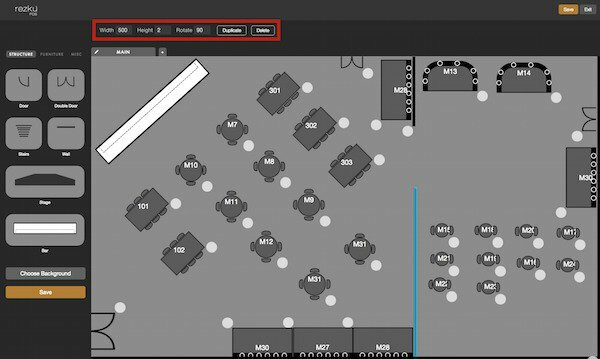 ● To access the Floor Plan Designer, log into Rezku POS Back Office and Click Floor Plan in the left-side navigation column. A full-screen web app for designing your restaurant floor plan opens in the browser window. ● Before you get started adding walls and furniture, you need to create a floor. 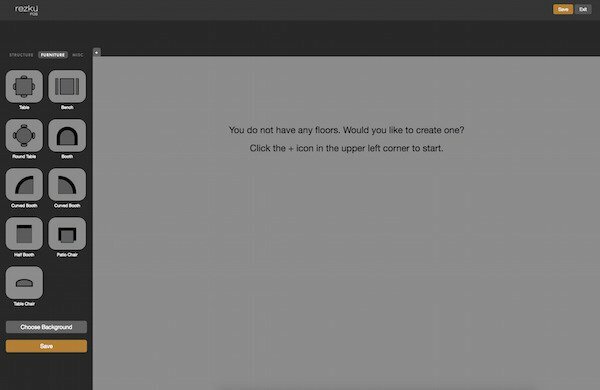 ● To create your first floor, click the small + tab. The New Room window appears. ● Give your room a name and click the Save button. 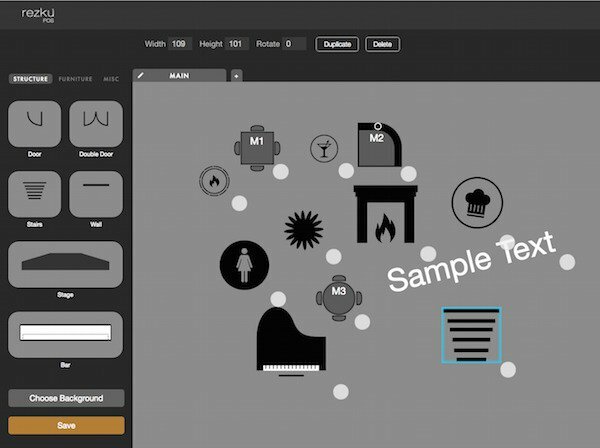 The Floor Plan Designer has many customizable objects for you to use. There are three tabs full of objects you can place and modify! ● To add an object from the sidebar to your floor plan, click and drag it to a space on the floor. 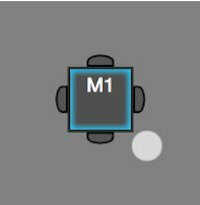 ● To select a placed object, click it. Selection is indicated by a blue highlight around the object. 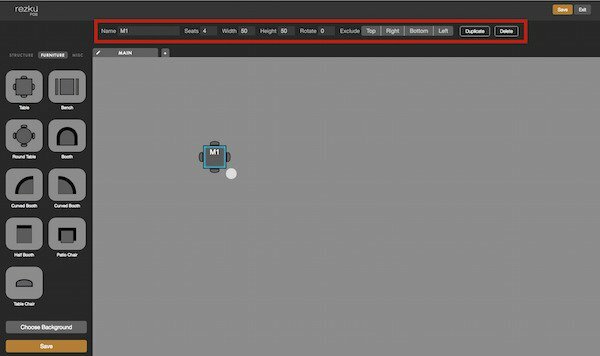 When an object is selected, you can change its properties. 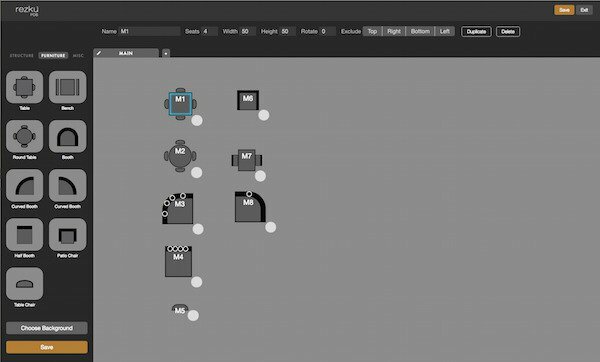 Objects have different settings, depending on type. There are three different types of objects: Furniture, Structure, and Misc. The furniture collection has many different tables and booths to choose. They look different, but all function the same way. Furniture objects are the only items that guests can be assigned to. When you drag furniture from the sidebar to the floor, it’s assigned a table number automatically. This can be changed in the object properties at the top of the screen. You can also adjust the size and set the number of seats for each table, as well as exclude sides of the table from having seats. 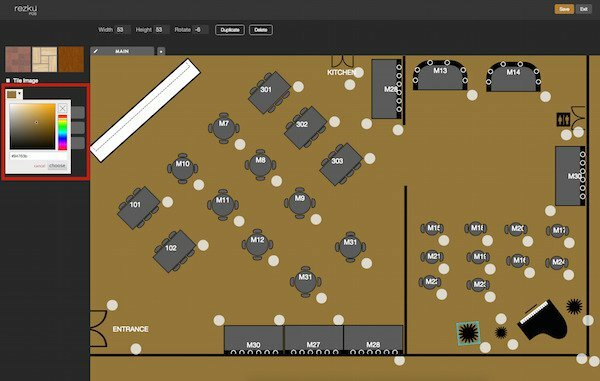 The Floor Plan Designer lets you match your restaurant's layout accurately. In this example, we modified the table properties, changing the name, number of seats, width, and rotation. 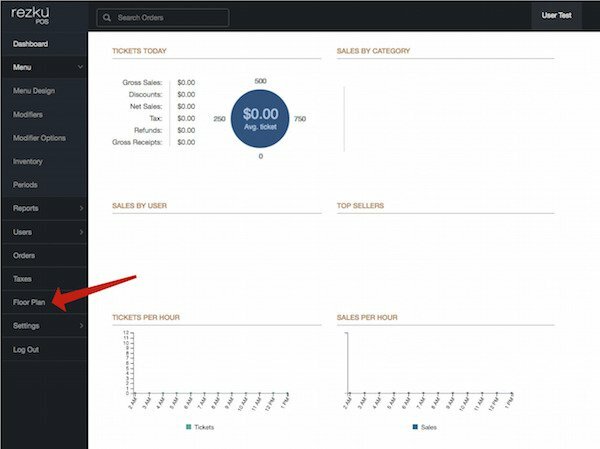 The duplicate button lets us quickly add multiple tables to our layout with the same properties. Duplicates appear in the top left corner of the floor. Click and drag the table to move it where you want it. Duplicate tables are named automatically, but you can change the properties for a duplicate table, just like a new table. The structure tab includes items like walls and doors that can be added to your floor plan. 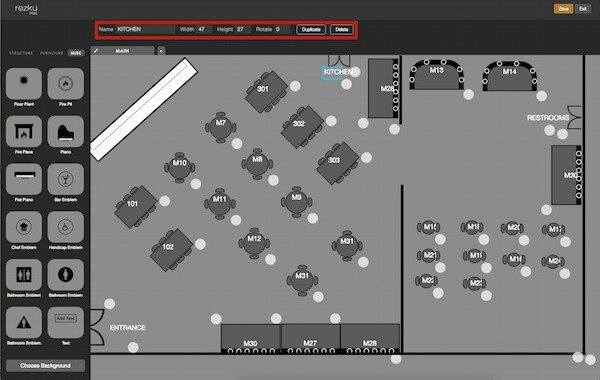 To add an object to your floor plan, click the structure tab and drag the item to the floor. 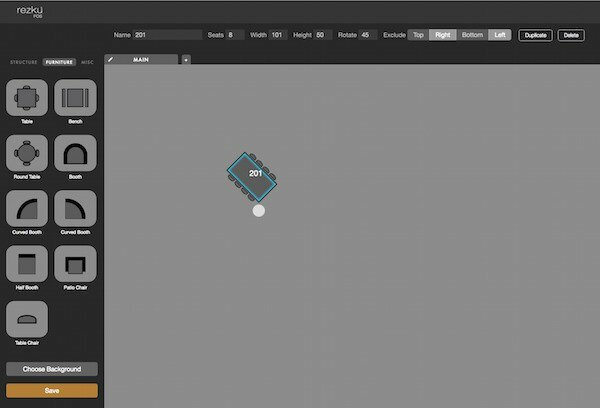 ● To move the object, click and drag to reposition it. A blue highlight indicates a selected object. 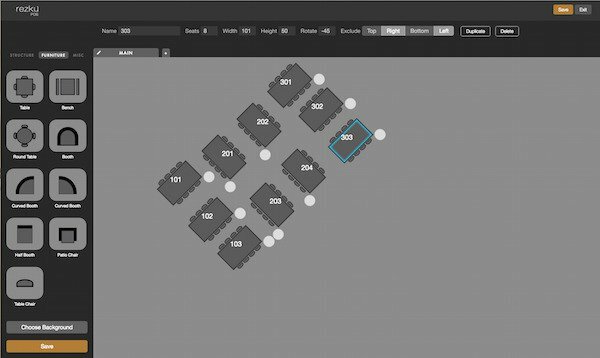 ● Adjust the size of objects to fit the proportions of your room by changing width and height in the properties strip along the top of the screen. The Miscellaneous tab has signs and other objects that may be useful when setting up a floor plan such as plants. Some of the most useful Misc objects are text labels. To add text, click and drag the Text object to the floor. To edit the text, make sure it is selected (blue highlight) and modify the properties at the top of the screen. You can change the color of the background or use a background image. ● Click the Choose Background button. 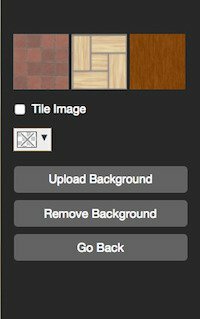 There are several basic backgrounds provided that can be tiled (repeated), for your background. You can also choose a solid-color background. ● Click the color chip and choose a new color from the pop-up. You can also upload a custom background image. Any standard computer image file will work, and the image can be tiled to fit. You can always remove the background later if you decide you don’t like it, so feel free to try out different things! Background images are like desktop wallpaper and do not affect objects. ● Click the Go Back button to return to the object library. Before you close your browser or exit the Floor Plan Designer, it’s very important to save your floor plan. If there are any tables with the same name, you will get an error. The floor plan will not save if there is an error. 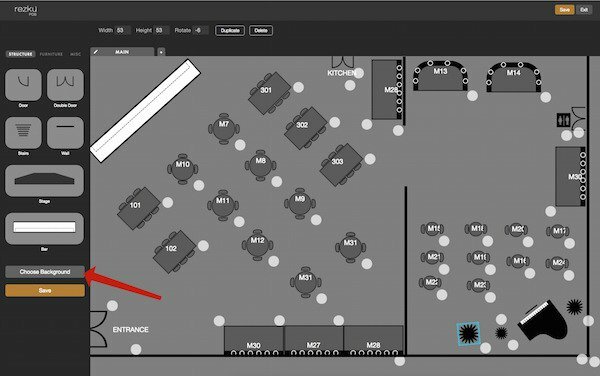 You can now safely exit the Floor Plan Designer without losing your work. ● Click the Exit button, and you will be returned to the Back Office Dashboard.